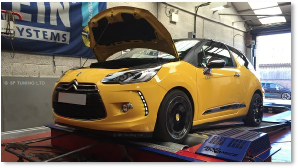 Based at our workshop in Burbage near Hinckley, Leicestershire, we have a 2 wheel drive Dyno Dynamics Rolling Road that is able to accurately graph up to 1200 BHP and 1500 Ft/Lb Torque (estimated flywheel). Due to the high level of accuracy of the Dyno Dynamics Rolling Road, power and torque repeatable measurements can be made to a decimal accuracy of 0.1. Measurements can be made in Pferdestarke (PS), Kilowatts (KW), Brake Horse Power (BHP) and Torque in PoundFeet (FT/Lb) or Newton Meters (Nm). Boost pressure in PSI, BAR or KPA. Fueling as Air : Fuel ratio (AFR) or Lambda etc. Before arriving for your appointment please ensure that your vehicle has ground clearance of at least 100 mm and is in a serviceable condition, (for example please check oil and water levels, tyre condition and pressure and cambelt).